The room was dark. Suddenly strange noises were being played, but still no visuals. It was late in Sony’s press conference and I knew there was only one necessary thing missing. The feed lights up again and it’s clear: The best has been saved for last. The Last of Us. What followed was a jaw-dropping edge-of-my-seat rollercoaster ride of emotions. Wonder at the urban environment overrun by vegetation, appreciation for the level of detail and, most importantly, amazement from start to finish. Being the Uncharted fan that I am, it’s hard to imagine I’d say I was surprised by their footage. I’d felt all the wonder and amazement over the course of three games with Nathan Drake, but there is one thing I hadn’t felt before with Naughty Dog and that was unease. After a short trek through an empty environment, the main characters Joel and Ellie come across a building full of what appear to be raiders and hobos. Connecting with their disdain of those who loot and sleep on cardboard boxes, Joel proceeds to stealthily choke a dude out. It isn’t long before his buddy notices and hell breaks loose and that’s when unease and uncertainty decides to rear its beautiful ugly head. The Last of Us, however amazing it looked visually, didn’t make its violence look glorified. The way Joel struggled and staggered in combat, his enemies bared down on him and Ellie tried to help keep him alive gave it all weight. Yet when Joel would get the upper hand, roles would reverse and suddenly he was the aggressor and enemies would beg. It’s truly a survival of the fittest series of moments. Throughout this entire action sequence, Joel is extremely limited in resources. His revolver starts with 4 bullets and is quickly depleted. He’s outgunned and outnumbered. Worse yet, Ellie is an unarmed teenage girl hoping to get through this sticky situation alongside him. It’s no longer about being the sure-fire hero and emptying all of the planet’s bullets into idiot thugs. Shots need to count, strategies need to be devised, risk should be weighed against reward and you probably don’t want to let these guys shoot anywhere near Ellie. The nature of this demo played out in a way that just screams that we’ll see dynamic experiences in the full game. If Joel attempts to fire an empty gun, enemies can take notice of this and advance on him without mercy. There appears to be a crafting system that allows for molotov cocktails and other goodies, as well as different types of bullets for multiple guns and even arrows. Joel can even get up close and personal for melee takedowns and even turn losers into human shields. 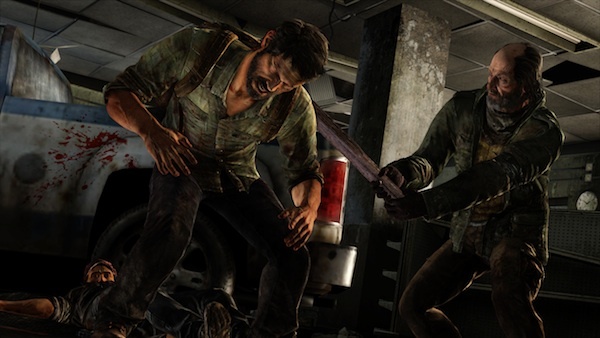 On the less certain side, seeing Ellie assist Joel when he was in a jam was awesome, but it’s hard to pin that down as a common gameplay occurrence just yet. I sure can hope so. The demo ends on a visceral, and pretty gruesome, victory note and yet I was too overcome with awesome-sauce to really consider the ramifications of all that I had just seen. Why had Joel and Ellie just assaulted all of these not-so-nice looking dudes? What was in that building in the first place? Where were the creatures that are running amok during all this? I’m certain this will all be answered in the game itself, but this demo has definitely made its mark on me in multiple ways. I can’t wait to be uneasy with The Last of Us when it releases in 2013 on the PlayStation 3. No interest in Uncharted with Zombies. I know there’s a bit more to it but the zombie genre is hackneyed at this point but I could say that about a lot of video games, so of course the pairing makes sense. Boooooo. No fungus-zombies in this video. It’s the humans and your lack of ammo that you have to worry about. Thankfully, there are a few bricks laying around.